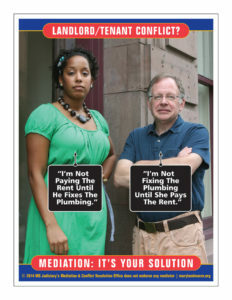 CMC staff and volunteers will be participating in a Tenant Rights workshop convened by the City of Knoxville Office of Neighborhoods (David Massey, 865-215-3232) and Parkridge Community Organization (Jennifer Montgomery, 865-406-4364). 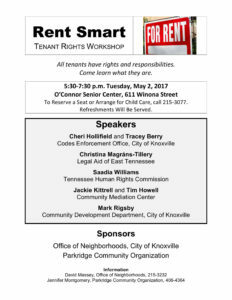 Jackie Kittrell, Executive Director and CMC Volunteer Sessions Mediator, Tim Howell, will be on the panel, along with representatives from Legal Aid of East Tennessee (Christina Magrans-Tillery) and Tennessee Human Rights Commission (Saadia Williams), as well as City Codes Enforcement (Cheri Hollifield and Tracey Berry) and City of Knoxville Community Development (Mark Rigsby). At the O’Connor Senior Center, 5:30-7:30 PM. To reserve a seat and/or arrange for childcare, please call 865-215-3077. Refreshments will be served!